Christmas trees don’t usually adorn the sea bed, but that doesn’t mean you can’t replicate the undersea home of the Disney Princess Ariel on your tree this holiday season with these Little Mermaid Christmas ornaments. The selection of Little Mermaid Christmas ornaments that are available to buy are a beautiful addition to any Christmas tree. They really do add a lovely touch of the nautical to the holiday season. These ornaments will also make any little Ariel fan’s eyes light up in delight (almost as much as after Santa has been). Decking the tree with ornaments that various members of the family will adore just makes your holiday decorating even more special. This Little Mermaid Christmas ornament features Ariel with her two friends Flounder and Sebastian who are helping her decorate her very own coral Christmas tree. As an aside I do love the idea of using coral as a Christmas tree! To me this ornament really captures Ariel in her natural environment and always brings a smile to my face when I see it. I love the way that Flounder and Sebastian are ‘helping’ to decorate the ‘tree’ by draping pearls over it while Ariel adds the star (or is that starfish?) to the top. This set of two Hallmark Christmas ornaments represents Ariel wishing she had legs so that she could be with Prince Eric who she had fallen in love with upon first sight. A great representation of the two sides of Ariel – the princess with legs and the little mermaid. This beautiful set of Little Mermaid Christmas ornaments comes in a bound storybook box to keep them safe. It also looks very impressive so would make a gorgeous gift for someone who loves Disney’s Princess Ariel. The set includes Ariel in two different poses, her father, Sebastian the crab, her best friend Flounder and more. I know not only a very little girl who would love this as a gift, but also a few ‘not so young girls’ who would love to have this set for their tree. You could hang these ornaments on any tree – a real one, an artificial one in green or white, but what I would love to do is to get a pale turquoise colored table top tree to represent the ocean and hang these ornaments on it. There are so many different Little Mermaid Christmas ornaments available to purchase that it’s impossible to add them all here. I do think that the ornament set is ideal if you want your whole tree to be a Little Mermaid or a fairytale nautical theme. I have featured a few more below and be sure to check out the other Disney Princess ornaments available if you want to tree dedicated to all of your royal favorites. This entry was posted in Uncategorized on March 23, 2016 by Lou. Are you looking for Bull Terrier Christmas Ornaments? I absolutely love these Christmas ornaments because of a beautiful dog I used to have. Let me tell you the story while we look at some gorgeous Bull Terrier Christmas ornaments together. When I was first married my hubby and I got our first dog together, her name was Shelly. She was a cross between a Bull Terrier and a Fox Terrier, she was as nosy as a Foxie and as stubborn as a Bull Terrier! Finding these Bull Terrier Christmas ornaments online are a fantastic reminder of our Shelly who passed away a few years ago. My hubby met Shelly before me when she was holding on to the lead of a fully grown German Shepherd dog (she was only a few weeks old) and taking it for a walk. The shepherd saw hubby come in and took off with our Shells trying to pull him backwards – very unsuccessfully. Well my hubby was hooked! That day he picked me up from work and said ‘you’ve got to meet this dog’, well our Shelly was always a very bright dog and this was evident when we first walked into the SPCA. I knelt down slightly and she bolted towards me and did a running jump straight into my arms, obviously I was a goner Shells was getting adopted! This entry was posted in Uncategorized and tagged bull terrier christmas ornaments, dog christmas ornaments on February 1, 2016 by Lou. Making Your Candy Cane Christmas Tree! Are you over green this year? What about having a red and white Christmas tree? Red and white is still very festive – think candy cane. Now I do have an actual red and white Christmas tree for you below, but the easiest way to obtain your own red and white tree is to use either a red Christmas tree or a white Christmas tree. Let’s take a look at how to create YOUR perfect red and white Christmas tree and be the envy of all your friends and family. First of all you need to decide if you’re going to start with a red tree or a white tree. I think red trees look awesome, but the white trees are a lot easier to find and as far as decorations go……do you know how many red Christmas tree ornaments there are??? I am going to start with the red tree, but you can jump ahead to the white if you wish. There are lots of red Christmas trees available, but I’ve kept my selection to three for you. All of them are different in shape so you should see one that suits you. This 6.5ft tall Christmas tree not only looks festive all lit up, it’s also a narrow tree which means it’s perfect if you’re living in an apartment and space is at a premium. It’s a pre-lit tree with 300 red mini lights and the great thing about these lights is that if one of the bulbs stop working it doesn’t effect the others and as both the lights and tree are red you don’t really notice the odd ‘non-working’ bulbs like you do with some trees. If you find it ‘too red’ with the lights and tree you can add some clear or white lights to the tree before you add your ornaments, but I do like a little red holiday cheer myself! This fir tree shaped Christmas tree is the type of traditional tree that my hubby prefers, although convincing him to get a red one will take a bit of doing! Vickerman make a lot of artificial Christmas trees and have a great reputation as well. This particular style of red tree comes in a range of sizes to suit so i the 3 foot one I’ve featured here isn’t the right size for you just click on it anyway and choose a different height from 3 ft up to 14 ft (if available at the time of clicking). I do love the whimsical shape of this Christmas tree, there’s just something about it that appears almost magical and that’s before you even turn on it’s lights and add any ornaments! Now all of these Christmas trees are pre-lit so there’s no need to worry about lights which is great. Just choose the one you prefer, personally I like the whimsical looking tree that I’ve featured last, but I know my hubby would go for one of the more traditional shaped trees. Now it’s time to decorate which means……………. The white of these ornaments against the red of the tree is going to make your Christmas tree ‘pop’ this year. Start off with finding your perfect white Christmas tree topper whether you prefer a Christmas star or Angel tree topper it’s up to you. Next it’s time to find some cool white Christmas ornaments to add to your red tree for a stunning red and white themed Christmas tree. I’ve included the more traditional Christmas angel tree topper for you to enjoy, but I’ve also found a fun snowman tree topper that is (mainly) white, but also has a red hat – what could be better for a red and white Christmas theme?! I personally think the snowman head Christmas tree topper is priceless. There are a lot of different white Christmas ornaments you can use from icicle style ornaments and snowflake ornaments to a range of others including traditional baubles, finials and more. There are so many fun ornaments available in the classic white color that I’ve actually written a page that encompasses quite a few of them that you can check out below. Adding white ornaments to a bold, red tree gives a great red and white Christmas tree effect which makes quite a statement. I love hanging white Christmas ornaments on the tree because they make me think of snow! This selection of Christmas ornaments will help you to have a white Christmas if that’s what you’re dreaming of! Now that you’ve chosen your white Christmas tree it’s time to find some red decorations to dress it up with. I’m going to first show you some red Christmas tree toppers which will add the finishing touch to your tree very nicely. Next I’m going to show you a range of red Christmas ornaments which will help to add their holiday brightness to your tree. 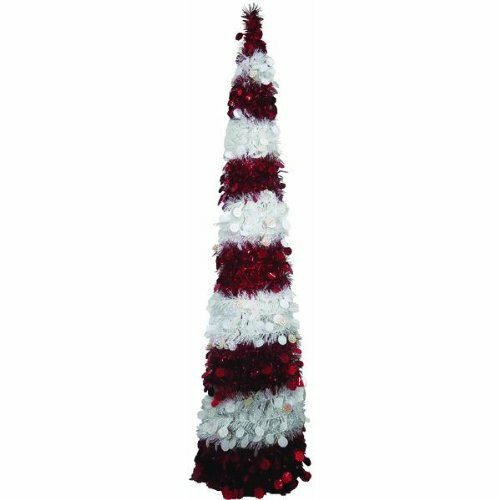 Red is one of the perfect colors for Christmas as it’s a very warm and cheery color as you can see in these gorgeous Christmas tree toppers I’ve found for you. A white Christmas tree can be used for lots of different colored ornaments, but to create that classic candy cane red and white look you’ll need to add red ornaments. There are lots of different red Christmas ornaments to choose from including the traditional ball style of ornaments that I’ve selected here as well as icicles, snowflakes, finials and more. There’s such a wide selection of ornaments available in this traditionally festive color that I’ve even compiled a collection of them on the page below which I think you’ll enjoy browsing through for ideas. While we’re talking about red and white themed Christmas tree what about a combined red and white tree like the one above? This is actually for sale and I think it looks awesome, don’t you? This tree is described as a pop up tree which are usually really easy to assemble, but I haven’t actually seen this tree to be able to let you know whether or not it is as easy as most pop up trees. The design is said to represent a candy cane swirl which is very festive, but it also reminds me a little of a light house so I’d love to use this in combination with lighthouse ornaments one year as I think it would make a great themed tree, but initially as I said above I’d just use it as it is. Beautiful on Any Christmas Tree! Now there are some ornaments which you can use on either your red or white Christmas tree and they are these beautiful red and white ones. Using red and white Christmas ornaments is also a way in which you can ‘ease in to’ a red and white Christmas – pop these on to your tree and get the feel for the color scheme…..maybe next year? There are lots of different red and white Christmas ornaments to choose from and you can even add candy canes to your tree to fill it out along with plain red and plain white ornaments – so many different options. Are you going to go for a red and white Christmas celebration this year? This entry was posted in Uncategorized and tagged red and white christmas ornaments, red and white christmas tree, red christmas ornaments, red christmas tree, white christmas ornaments, white christmas tree on November 16, 2015 by Lou.